The arrival of iOS 8 and OS X Yosemite brought the Continuity and Handoff features that have tied the two mobile and desktop platforms together like never before. Being able to jump from mobile to desktop and vice versa without losing the webpage you’re reading or the document you’re working on is a simple thing in practice, but something that really adds value. The problem is that while Yosemite is available for Macs reaching all the way back to 2007, Continuity and Handoff only work with certain machines even if they happen to be on Apple’s Yosemite compatibility list. To cut a long story short, any Mac that doesn’t include a Bluetooth 4.0 chip isn’t going to work. 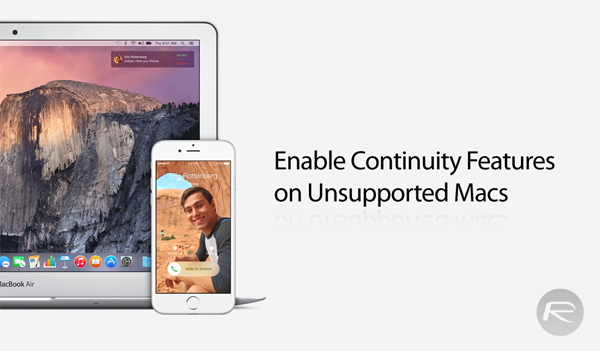 But all is not lost folks, because there is a tool that can activate Continuity features such as Handoff, Instant Hotspot and AirDrop from iOS to OS X on Macs that don’t natively support it so long as there is a way of getting said Bluetooth requirement satisfied, whether that be via a dongle or a replacement card. That’s the relatively hard part, with the easy part being installing the tool itself. It’s called Continuity Activation Tool and it just received an update to version 2.0 that means even older Macs can now get in on the action. Let’s take this writer’s unibody MacBook as an example. Built in late 2008, it runs Yosemite just fine but can’t do any of the fancy Continuity stuff because it doesn’t have Bluetooth 4.0 built in. No fear though, because with Continuity Activation Tool 2.0 and a handy Bluetooth dongle, all of the Continuity and Handoff wizardry can be unlocked. What’s even better is the tool is free, meaning the cost of the new hardware is all that needs to be outlaid. 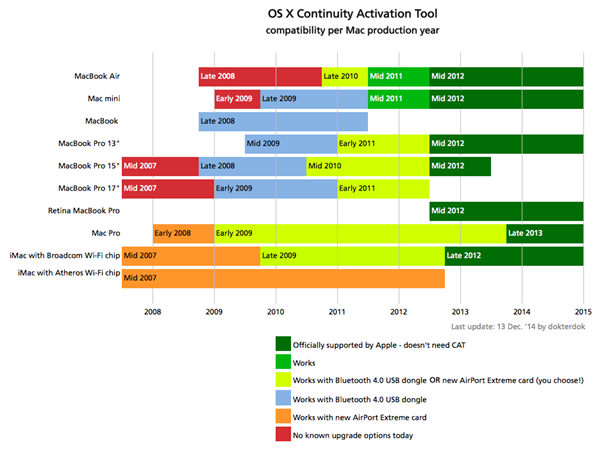 Continuity Activation Tool 2.0 released : Adds compatibility with Bluetooth 4.0 USB dongles, allowing many Macs from 2008 and later to easily upgrade to Continuity. See the chart below to verify available upgrade options. Needless to say, if you’re quite taken with the idea of Continuity and have the means to get the hardware required then installing this tool is a no-brainer. Do it, do it now and never look back. You can download the new and updated Continuity Activation Tool 2.0 from here. Which dongle would i used for a 20′ 2008 iMac ?. Should work with most Broadcom based Bluetooth 4.0 USB dongles. Taimur is cocksucker of Mohammed gay boy….